The domain within your query sequence starts at position 540 and ends at position 923; the E-value for the ADEAMc domain shown below is 3.74e-205. Editase (EC 3.5) are enzymes that alter mRNA by catalyzing the site-selective deamination of adenosine residue into inosine residue. 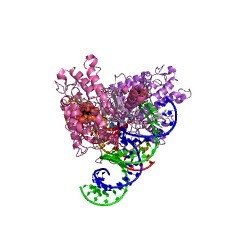 The editase domain contains the active site and binds three Zn atoms [(PUBMED:9159072)]. Several editases share a common global arrangement of domains, from N to C terminus: two 'double-stranded RNA-specific adenosine deaminase' (DRADA) repeat domains (IPR000607), followed by three 'double-stranded RNA binding' (DsRBD) domains, followed by the editase domain. Other editases have a simplified domains structure with no DRADA_REP and possibly fewer DSRBD domains. Editase that deaminate cytidine are not detected by this signature. There are 1742 ADEAMc domains in 1742 proteins in SMART's nrdb database. Taxonomic distribution of proteins containing ADEAMc domain. This tree includes only several representative species. The complete taxonomic breakdown of all proteins with ADEAMc domain is also avaliable. Click on the protein counts, or double click on taxonomic names to display all proteins containing ADEAMc domain in the selected taxonomic class. Editing of messenger RNA precursors and of tRNAs by adenosine to inosine conversion. The double-stranded RNA-specific adenosine deaminases ADAR1 and ADAR2 convert adenosine (A) residues to inosine (I) in messenger RNA precursors (pre-mRNA). Their main physiological substrates are pre-mRNAs encoding subunits of ionotropic glutamate receptors or serotonin receptors in the brain. ADAR1 and ADAR2 have similar sequence features, including double-stranded RNA binding domains (dsRBDs) and a deaminase domain. The tRNA-specific adenosine deaminases Tad1p and Tad2p/Tad3p modify A 37 in tRNA-Ala1 of eukaryotes and the first nucleotide of the anticodon (A 34) of several bacterial and eukaryotic tRNAs, respectively. 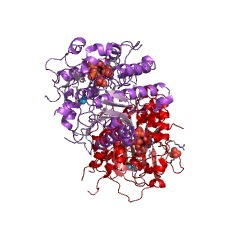 Tad1p is related to ADAR1 and ADAR2 throughout its sequence but lacks dsRBDs. 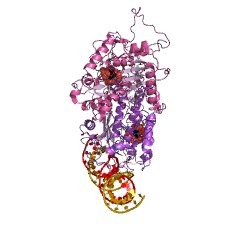 Tad1p could be the ancestor of ADAR1 and ADAR2. The deaminase domains of ADAR1, ADAR2 and Tad1p are very similar and resemble the active site domains of cytosine/cytidine deaminases. Crystal structure of the Zalpha domain of the human editing enzyme ADAR1 bound to left-handed Z-DNA. The editing enzyme double-stranded RNA adenosine deaminase includes a DNA binding domain, Zalpha, which is specific for left-handed Z-DNA. The 2.1 angstrom crystal structure of Zalpha complexed to DNA reveals that the substrate is in the left-handed Z conformation. The contacts between Zalpha and Z-DNA are made primarily with the "zigzag" sugar-phosphate backbone, which provides a basis for the specificity for the Z conformation. A single base contact is observed to guanine in the syn conformation, characteristic of Z-DNA. Intriguingly, the helix-turn-helix motif, frequently used to recognize B-DNA, is used by Zalpha to contact Z-DNA. Tad1p, a yeast tRNA-specific adenosine deaminase, is related to the mammalian pre-mRNA editing enzymes ADAR1 and ADAR2. We have identified an RNA-specific adenosine deaminase (termed Tad1p/scADAT1) from Saccharomyces cerevisiae that selectively converts adenosine at position 37 of eukaryotic tRNAAla to inosine. The activity of purified recombinant Tad1p depends on the conformation of its tRNA substrate and the enzyme was found to be inactive on all other types of RNA tested. Mutant strains in which the TAD1 gene is disrupted are viable but lack Tad1p enzyme activity and their tRNAAla is not modified at position A37. Transformation of the mutant cells with the TAD1 gene restored enzyme activity. Tad1p has significant sequence similarity with the mammalian editing enzymes which act on specific precursor-mRNAs and on long double-stranded RNA. These findings suggest an evolutionary link between pre-mRNA editing and tRNA modification. Molecular cloning of cDNA for double-stranded RNA adenosine deaminase, a candidate enzyme for nuclear RNA editing. We have cloned human cDNA encoding double-stranded RNA adenosine deaminase (DRADA). DRADA is a ubiquitous nuclear enzyme that converts multiple adenosines to inosines in double-helical RNA substrates without apparent sequence specificity. The A --> I conversion activity of the protein encoded by the cloned cDNA was confirmed by recombinant expression in insect cells. Use of the cloned DNA as a molecular probe documented sequence conservation across mammals and detected a single transcript of 7 kb in RNA of all human tissues analyzed. The deduced primary structure of human DRADA revealed a bipartite nuclear localization signal, three repeats of a double-stranded RNA binding motif, and the presence of sequences conserved in the catalytic center of other deaminases, including a cytidine deaminase involved in the RNA editing of apolipoprotein B. These structural properties are consistent with the enzymatic signature of DRADA, and strengthen the hypothesis that DRADA carries out the RNA editing of transcripts encoding glutamate-gated ion channels in brain. This information is based on mapping of SMART genomic protein database to KEGG orthologous groups. Percentage points are related to the number of proteins with ADEAMc domain which could be assigned to a KEGG orthologous group, and not all proteins containing ADEAMc domain. Please note that proteins can be included in multiple pathways, ie. the numbers above will not always add up to 100%.